The Sazerac Company originated in 1850 as a New Orleans coffee house (actually, a bar). It was named after an even older French brandy maker, Sazerac de Forge et Fils. Although 1850 is the date the company claims, 1869 might be a better one. That's when Thomas Handy purchased the Sazerac Coffee House and began to use it as a platform for marketing liquor products. Today, Sazerac is a large, privately owned-company with a vast portfolio of spirits and wine products. Some it manufactures, others it imports and distributes. Although it is ostensibly headquartered in a New Orleans suburb the company is run out of the Buffalo Trace Distillery in Frankfort, Kentucky, and is probably best known as a bourbon producer. For a look at some of the American whiskey brands Sazerac makes, click here. Although nothing in its portfolio rivals Jack Daniel's or Jim Beam for sales volume, names such as Van Winkle, Blanton's, and George T. Stagg make hearts flutter among bourbon enthusiasts. It all began humbly enough. In 1989 Seagrams sold a basketload of brands from its vast portfolio. Sazerac picked up two bourbons, Benchmark and Eagle Rare. The company didn't own a distillery so it partnered with Heaven Hill to supply the whiskey. The two even shared an advertising agency, Louisville's Fessel, Siegfriedt and Moeller (where I worked from 1978 until 1980). Benchmark and Eagle Rare were notable for being among the last new brands introduced after American whiskey sales began to tank in the late 1960s. That was also an era in which imitation was the sincerest form of flattery among spirits brands. Every successful product spawned numerous knock-offs. 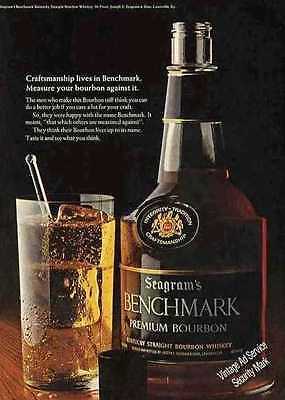 Benchmark, launched in 1968, may have been inspired by Maker's Mark, a very small brand then but one that charged a premium price and was growing. 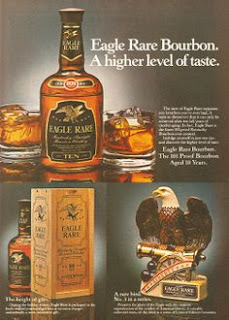 Eagle Rare, launched a few years later, is more obviously an homage to Wild Turkey. Who developed Benchmark is not known but Charlie Beam, grandson of Joe Beam, created Eagle Rare. Neither brand exactly turned the category around but both survived and were still selling well enough by 1989 to get Sazerac started as a national bourbon marketer. Three years later, the cozy relationship between Sazerac and Heaven Hill abruptly turned ugly when Sazerac bought a distillery. Japan's Takara Shuzo Co. had had an interest in the Ancient Age brand and Frankfort's Albert Blanton Distillery since Schenely sold them in 1983 to two veteran industry executives. The Blanton's bourbon brand was created primarily for Takara's use in Japan. With bourbon booming there, Takara wanted the brands but didn't want to operate a U.S. distillery. It sold the plant to Sazerac, with whom it forged a production and distribution agreement that continues to this day. Overnight, Heaven Hill and Sazerac went from being partners to bitter rivals. In a sideshow, the advertising agency was forced to choose between them. Although it had a longer relationship with Heaven Hill, Sazerac at the time was billing more so it won. Both companies survived the split, the ad agency did not. The distillery, established in the 19th century but largely rebuilt by Schenley after Prohibition, was very large and had a lot of unused capacity. Sazerac grew its bourbon business primarily with regional brands shed by the giant, increasingly international drinks companies. After Frankfort it acquired a large, modern bottling plant, along with a few whiskey warehouses in Owensboro. Next was a small distiller, rectifier, and bottler in Virginia; then a second bourbon distillery in Bardstown. At the time, the Barton Distillery was desirable primarily for its aging warehouses, but as bourbon sales exploded its distillery became a valuable asset too. Buffalo Trace was short of aging space because, during the dark ages, Schenley had converted some of its Frankfort warehouses into rentable office space. Today, all of Sazerac's distilleries operate at full capacity. Many of its brands sell so well they are on allocation. Its Van Winkle brand, made and sold in partnership with the Van Winkle family, has become an international phenomenon. Its other international phenomenon is Fireball, a cinnamon-flavored Canadian whisky. The company has purchased hundreds of acres of farmland adjacent to Buffalo Trace, where it is growing corn now but where aging warehouses will sprout over the coming decade. Those warehouses that became office space 40 years ago have become whiskey warehouses again. As Sazerac has made its acquisitions over the years it has also acquired more history. The Buffalo Trace Distillery was once owned by E. H. Taylor. 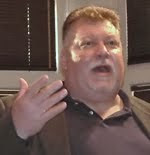 Barton was started by Tom Moore. Sazerac is heir to Mr. Boston, Peychaud's, Fleischmann's, and Glenmore. Its newest acquisition, Southern Comfort, is rooted in the same mid-19th century New Orleans that produced Sazerac itself. Today, with the entire distilled spirits category doing well and Kentucky-made whiskey doing fabulously, there are many new players. Sazerac has gone from a middling regional company to an international powerhouse in about 30 years. Will any of these newcomers do as well? The point is, they might. How did the spirits advertising fare with the US GOVERNMENT ban? The United States government has never banned alcohol advertising, except when alcohol itself was banned 1920-1933. Wow, back then Eagle Rare actually had an attractive-looking bottle instead of the current "anorexic wine bottle". Thanks for the explanation. Long ago I remember being told that the limits on ads were from the "government". I could not understand why beer commercials were allowed but hard stuff was not. Would it be fair to say that the industry made their own commercial restrictions before the FTC came up with a nationwide ban (like some foreign countries)? Just curious as to how DISCUS came up with the 71.6% adult viewer guide. After Prohibition, the industry was 'encouraged' to self-regulate with regard to advertising and promotion, which it did. Long term view. Brilliant strategy. We all win! And we see what the results are after the self-imposed liquor advertising ban is lifted: the substantial re-invigoration of spirits sales at the expense of beer, accelerating what might have been the natural return to prominence of spirits in the drinks cycle anyway.